The reusable clear case opens and closes with a snap and allows the Bible Journaler to see the contents at a glance. Set Includes: 12 Colored Pencils, 4 Fluorescent Pencils, 2 Metallic Pencils, 12 Compressed Color Sticks, and one of the following; Pencil Sharpener, Sanding Block, Kneadable Eraser, Blending Stump and one Reusable Container. 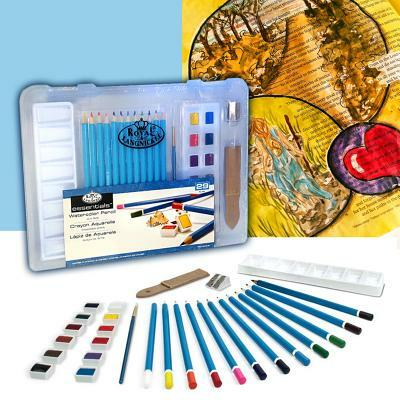 Royal Watercolor Pencils/Cakes was published by G T Luscombe in June 2016 and is our 63340th best seller. The ISBN for Royal Watercolor Pencils/Cakes is 0090672066206. Be the first to review Royal Watercolor Pencils/Cakes! Got a question? No problem! Just click here to ask us about Royal Watercolor Pencils/Cakes.